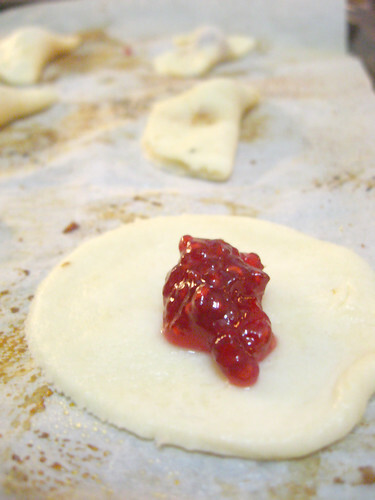 Jam Kolaches have to be one of my all time favorite Christmas cookies. Biting through the delicate savory cream cheese pastry helps set off the sweetness of the jam interior which almost pops in your mouth as you enjoy this rich little treat. I have to admit, because each cookie has to be filled with jam and folded over individually, its a little high on the putzy meter, which is why this is always one of the first batches I make (before I am too sick of baking to be bothered). Its worth the time though. I make them every year with NO REGRETS! Jam of your taste. I always use raspberry, because, come on, raspberry is the best. approx. 1/4 c. sifted confectioners sugar. Using a mixer, cream butter and cream cheese together until light and fluffy. Add flour slowly and mix until a dough forms. Chill in fridge for 15-20 minutes (you can skip this if you are in a hurry). 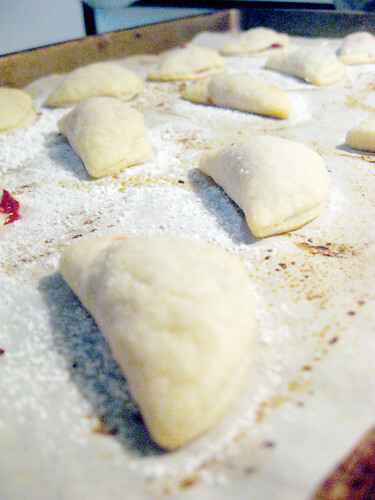 Roll dough out on a floured surface to approx 1/4″ thickness. Using a 2″ round cookie cutter cut out as many circles as you can. 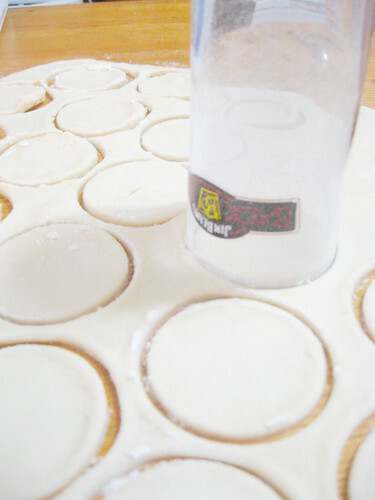 If you don’t have a round cookie cutter (I don’t) you can use a drinking glass or a tin can. Just dip glass or tin can in flour to coat edges before cutting. 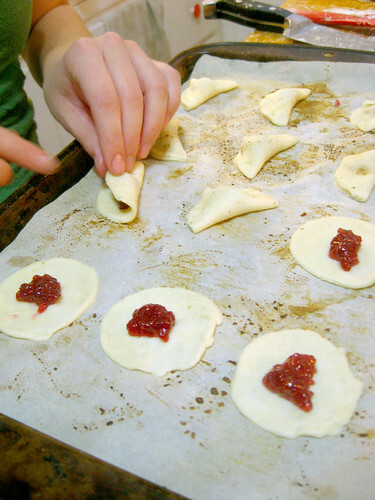 Place dough circles on a baking sheet with parchment paper or silicon lining. You can also just grease it if you don’t use those things, but I suggest parchment at least (helps to keep your dough from burning). Brush one side of dough circle with milk. Spoon 1/4 tsp jam on each cookie. Fold opposite sides together, slightly overlapping edges and gently pinch closed to form little half circle pockets around jam. 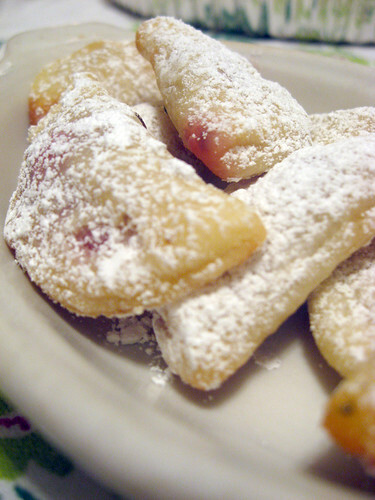 Remove to cool and sift confectioners sugar over cookies. These cookies are truly precious. and you’ll find your pants not fitting. OMG those jam kolaches look fantastic. 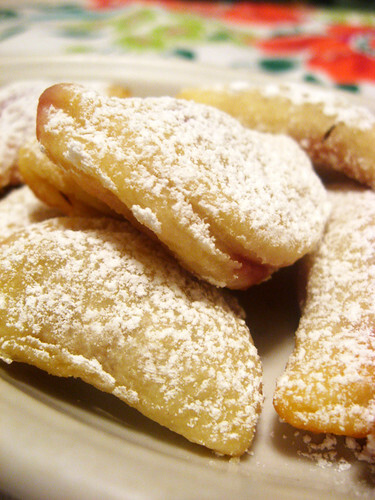 I’m going to be making them for Christmas yummie.